Rays still loaded; Jays have talent to back top prospect Vlad Jr. While their outfield likely will be without Bryce Harper for the first time in seven years, the Nationals have an exciting option in Victor Robles. MLB.com's No. 4 overall prospect boasts five strong tools with well-above-average speed, arm and fielding. He spent 21 games in the Majors last season and is a prime candidate to fill the gap this year. Carter Kieboom showed he could hit for power and average with Class A Advanced Potomac and was promoted to Double-A Harrisburg before his 21st birthday. The 2016 first-rounder has spent his entire career at short, though his plus defense could allow him to move elsewhere if the Nats want to keep Trea Turner where he is. Luis Garcia was the youngest player in the All-Star Futures Game at 18 last summer and electrified with his above-average speed and ability to make solid contact from both sides of the plate. While those three players give fans plenty to be excited about, the system's relative lack of depth drops it to No. 10. Following in the footsteps of Ozzie Albies and Ronald Acuna Jr., Austin Riley and Cristian Pache are turning heads in this pitching-heavy system. Featuring plus-plus run, arm and fielding tools, Pache is one of the Minors' top outfielders. He finished 2018 in the Arizona Fall League before turning 20 in November. Riley doesn't have any 70-grade tools, but he does show potential across the board, especially with power. Ranked as the Minors' No. 3 third baseman, he shook off a knee injury before finishing the season strongly at Triple-A. Switch-hitter Drew Waters could one day join Acuna and Pache in the Atlanta outfield after displaying plus speed and defense in his first full season. Waters' teammate, William Contreras, has shown an ability to make contact and could be a defensive asset behind the plate. Greyson Jenista, a 2018 draftee, is quickly rising through the system, while 2015 signee Derian Cruz possesses 70-grade speed in the lower levels. Still, the Braves' pitching overshadows their position player counterparts. A year ago, the Angels boasted baseball's top prospect in Shohei Ohtani. But since the two-way phenom never played an inning in the Minors, Jo Adell has been the system's true top prospect all along. Adell, whom MLB.com ranks No. 14 overall, has a high ceiling with four plus tools. And if the 2017 first-rounder can cut down on strikeouts, he could be an All-Star. Th Angels also have toolsy outfielders Brandon Marsh and Jordyn Adams and are so stacked on the grass that they moved the athletic Jahmai Jones to second base. After a slow start to his career, outfielder Michael Hermosillo got multiple opportunities in Anaheim last summer and could break camp with the big club this spring. In the infield, catcher-turned-first baseman Matt Thaiss has begun to meet the high offensive threshold of his relatively new position. Switch-hitting infielder Luis Rengifo hit and ran his way onto the 40-man roster, and there remains hope that shortstop Kevin Maitan can grow into the impact player expected at his signing. The Angels might have just one prospect in MLB.com's Top 100, but they have a lot of talent in the pipeline. First-round picks lead the way in the Twins system. No. 5 overall prospect Royce Lewis showcased a plus hit tool and plus-plus speed as he climbed from Class A to Class A Advanced last year with Alex Kirilloff. After missing the 2017 campaign following Tommy John surgery, Kirilloff was brilliant, batting .348/.392/.578 with a Minors-best 71 extra-base hits. Trevor Larnach, the 2018 first-round pick out of Oregon State, raked at Rookie Advanced and Class A in his pro debut. His 2014 counterpart, Nick Gordon, got off to a great start in his second taste of Double-A but had trouble adjusting to Triple-A in the second half of the season. Meanwhile, 2017 CBA pick Brent Rooker brought the power (and strikeouts) to Double-A. International signee Wander Javier missed all of 2018 after tearing the labrum in his non-throwing arm, but catcher Ryan Jeffers and infielder Yunior Severino showed a lot of promise in Rookie ball. With Lewis and Kirilloff taking the lead, the Twins have a lot of hope down the line. The Dodgers have a potential stud at just about every position, including a few guys who can play multiple spots. Outfielder Alex Verdugo lit up the Pacific Coast League before heading to LA for the second straight season. Keibert Ruiz cut down his strikeouts considerably as a switch-hitter, fanning 33 times in 101 games at Double-A. Shortstop/second baseman Gavin Lux broke out with a .394/.399/.514 line, while fellow 2016 picks Will Smith and DJ Peters powered up with career highs of 20 and 29 homers, respectively. Outfielder Jeren Kendall didn't take much advantage of the hitter-friendly California League, but he used his 70-grade speed to steal 37 bases. In December, Los Angeles picked up shortstop/second baseman Jeter Downs in a blockbuster trade with the Reds. While the 20-year-old didn't hit much in his first pro season, he showed the ability to use all fields. Aside from Downs and backstop Diego Cartaya -- who signed in July and did not play -- most of the Dodgers' top position players reside in the upper two levels, placing a lot of talent one call from The Show. Nick Senzel is one of the game's most promising prospects, but injuries took a big toll last season. With five exciting tools, baseball's No. 6 overall prospect could be an All-Star both offensively and defensively. Senzel took reps in the outfield in the instructional league and will be in the running for an Opening Day spot in Cincinnati, potentially in center. Just 10 spots behind Senzel in the Top 100, Taylor Trammell started the year strong and earned All-Star Futures Game MVP honors, but the outfielder lost momentum in the second half. Crashing into a wall and suffering a concussion didn't help. Following their 2018 Draft selections, Jonathan India and Mike Siani got off to hot starts in the Appalachian League. Siani kept raking for Rookie Advanced Greeneville, while India seemed to hit a wall in the Class A Midwest League following a long spring of college ball. Tyler Stephenson, a 2015 first-rounder, hasn't made it past Class A Advanced as he continues to develop at and behind the plate. Outfielders Stuart Fairchild, Jose Siri, TJ Friedl and Michael Beltre along with shortstop Alfredo Rodriguez possess plus speed at the middle levels, with Siri and Friedl earning 70 grades. Center fielder Mariel Bautista continued to show potential but has yet to make his full-season debut in four years. The Reds have a lot of depth, anchored by three big names, but they're not quite as solid as the next four teams. For the second year in a row, the White Sox rank in the Top 5, led -- of course -- by No. 3 overall prospect Eloy Jimenez. Jimenez notched his best season in 2018 with a .337/.384/.577 line, 22 homers and 75 RBIs across Double-A and Triple-A, putting himself in position for an early callup this spring. Outfielder Luis Robert could be a five-tool player but has battled injuries. Class A Advanced Winston-Salem showcased much of the club's top talent a year ago, with 2018 fourth-overall pick Nick Madrigal, outfielders Blake Rutherford, Micker Adolfo, Luis Gonzalez, Luis Alexander Basabe and first basemen Gavin Sheets all donning the purple and white at some point. Meanwhile, catcher Zack Collins showed plenty of patience at the plate, outfielder Steele Walker struggled at Class A and 2017 first-rounder Jake Burger missed the entire season with an Achilles injury. The White Sox have enviable depth behind Jimenez, Robert and Madrigal, but it remains to be seen how those lower-ranked prospects will turn out. The Padres' youth movement has been a long time coming, and it's finally reaching the Majors. No. 2 overall prospect Fernando Tatis Jr. is a shining star with a complete set of tools that grade well-above average. While a thumb injury limited him to 88 games at Double-A last year, the shortstop should be quick to pick up where he left off. Infielder Luis Urias and catcher/outfielder Francisco Mejia already got their first tastes of Petco Park, thanks to potentially special bats. Since being acquired from the Indians in July, the latter's offensive production at Triple-A improved in both power and average. Outfielder/first baseman Josh Naylor, third baseman Hudson Potts and catcher/first baseman Austin Allen all showed power at Double-A, while teammate Buddy Reed (outfield) showcased 70-grade speed with 51 stolen bases. Below that group, the Padres have Tirso Ornelas (OF), Esteury Ruiz (2B/3B), Jeisson Rosario (OF), Gabriel Arias (SS) and Luis Campusano (C) leading the middle levels, while 2018 picks Xavier Edwards and Owen Miller already have made splashes. The depth, highlighted by Tatis, Urias and Mejia, make this a really exciting time for Padres fans. Life's good when you have baseball's top prospect. In his third pro season, Vladimir Guerrero Jr. continued to put up monster numbers, and he has the tools -- including a very rare 80-grade hit tool -- to prove it's not a fluke. While his defense remains a question, Guerrero made strides at third base last year but could move to first or DH down the line; his bat still would make him an All-Star. While Bo Bichette was going hit-for-hit with Guerrero in 2017, he came back to earth last year. The shortstop still piled up 61 extra-base hits, 74 RBIs and 32 stolen bases at Double-A. Catcher Danny Jansen collected a career-best 12 homers and 58 RBIs in 88 games en route to his Major League debut, while fellow backstop Reese McGuire, first baseman Rowdy Tellez and outfielders Anthony Alford, Jonathan Davis and Billy McKinney also made it to Rogers Centre. Aside from Guerrero -- who missed six weeks with an injury -- Cavan Biggio was the most electric hitter in the system last year. The left-handed batter led the organization with 26 homers and 99 RBIs and topped the Eastern League with an .887 OPS. In their first full seasons, 2017 picks Kevin Smith and Logan Warmoth climbed to Class A Advanced, though the latter battled injuries. Last year's second-rounders, Jordan Groshans and Griffin Conine, along with 2017 international signee Miguel Hiraldo started off with a bang but were challenged after promotions. Toronto added depth by trading for shortstop Santiago Espinal (from Boston) in June, outfielder Forrest Wall (from Colorado) in July and shortstop Ronny Brito (from the Dodgers) in January, as well as signing shortstop Orelvis Martinez. It's easy to hang your hat on having the top prospect, but the Blue Jays have a great deal more -- and Guerrero really is that good. No. 1 and No. 2 remain the same for the second straight year, but the Rays have a new leader in the metaphorical (and one day literal) clubhouse. A year after being signed, Wander Franco really made a name for himself (and that says a lot given he has two brothers in the Minors with the same name). The switch-hitter possesses plus tools across the board, electrifying Rookie Advanced with a .351/.418/.587 line in his pro debut. Four years after being signed, outfielder Jesus Sanchez, catcher Ronaldo Hernandez and second baseman Vidal Brujan shined in 2018, with Sanchez reaching Double-A. Second baseman Brandon Lowe improved every part of his game, including a move to the outfield en route to the Majors, while Nathaniel Lowe (no relation) also climbed three levels while clubbing 27 homers and batting .330. 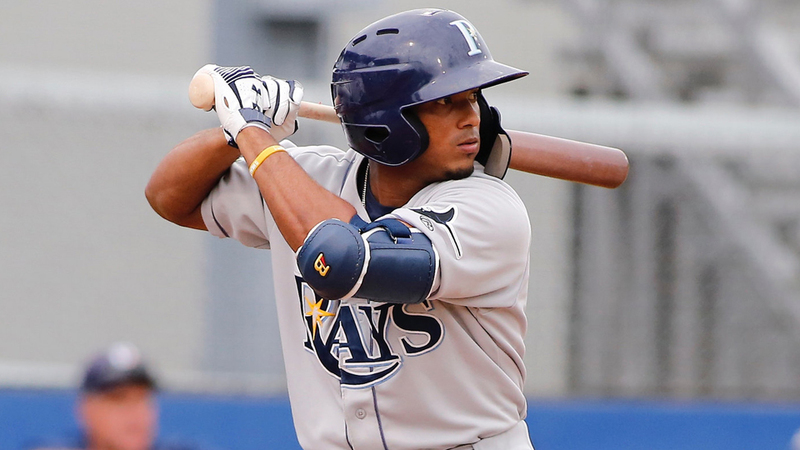 Although the Rays have plenty of infield depth, Nick Solak and Lucius Fox provide even more. The former took reps in the outfield to smooth his path to Tropicana and the latter is just plain quick with 70-grade speed. And we haven't mentioned two-way stud Brendan McKay, whom the Rays recently announced will be a designated hitter when he's not pitching. While McKay has found more success on the mound, Tampa Bay has another two-way player on the horizon with 2018 second-round pick Tanner Dodson. The Rays have options upon options at every position to back up their young arms.